In case you've been asleep for the last 13 years, Maddslinky is the alias of veteran UK producer and acknowledged progenitor of Dubstep, Zed Bias. 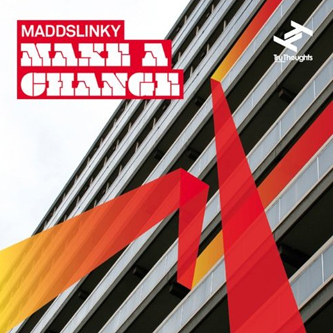 With 'Make A Change' he presents the updated sound of Maddslinky, featuring guest spots from Skream, Mr Scruff, and Jenna G. Over 14 tracks he travels between rooted dubstep like 'Lionheart' with Ghost1 and Mighty Moe, cruising Kwaito House styles on 'Dub Is For Real' with Mr Scruff, to symphonic future soul on 'Further Away' feat. Taiwah. The best tracks have to be his masterful Breakbeat Garage collab with Skream, the charming Afro-beating Funky tilt of 'Lost On Tenori Street' (as played by Martyn on his Fabric mix) or his most syncopated tracks like the taut stepper 'Peru', or the darkside propulsion of 'Cognitive Behaviour'.